Manhattan is such a dense show the story tends to crowd out the rest, but get a load of the succinct, wordless opening images of the second to last episode of the season. First we get a god’s eye view of the gadget through the geometric ordering of the scaffold, the camera dropping out of the sky toward the bomb. Then a pan along the room where the decisions will be made, ending with Charlie’s seat at the table. That’s the fruit of the second half of the season, ever since Frank came back. The first season was about the bomb. The second is about what it means—where to drop it, the effects of radiation, what it means for someone to have and use that power. In this opening the weapon and the wielders are equally important, but only one gets the ominous weight. The weapon that’s going to go off in “Brooklyn” isn’t the bomb. It’s Charlie. Frank’s plan always seemed rickety. He’d enlist Lazar to switch the colors on one of the detonators so the test would fail and he’d be called in to fix it, which he would do only after manipulating and then outright blackmailing Charlie to plead for a “peaceful” demonstration of the world’s greatest destructive device to date. That leaves a lot of room for error. But it’s not the first time Frank has successfully run pretty much everything on the hill from his little office in implosion. Besides, it actually worked. Just a little too early. Enter Abby. At first it seemed ridiculous to watch Abby ask for a moment of Oppenheimer’s time to interrogate him about his mistress during the two days he’s busy preparing for the big show. We go from the surprise return of Justin Kirk, codename “Bucher,” and the arrest of Meeks’ handler, Victor, and a scrap of paper with “Brooklyn” written on it to Abby poking J. Robert “I am become death, destroyer of worlds” Oppenheimer about his mistress. Christ, Abby. It can wait. But it’s certainly not out of character for the hill’s resident busybody to insinuate herself into the proceedings, to make this bomb about her. And she isn’t just acting out of tourism or gossip. She’s felt responsible for Jean Tatlock’s death. She’s felt her own miscarriage was divine justice. And now she knows Jean didn’t kill herself because Abby threatened her. She didn’t kill herself at all. As the men prepare to blow up the world, Abby finds out both Darrow and Charlie have let her suffer that extraordinary guilt knowing full well that Jean didn’t kill herself. No wonder she’s on the warpath. Unfortunately, Abby feeling betrayed leads to a whole bunch of civilians being wiped off the map in Japan. They’re not her fault any more than Jean was, but Abby’s involvement in the Oppenheimers’ marriage leads to Jean’s death and Charlie and Darrow’s involvement in it, which leads to her sending Joey off to Brooklyn to live with his grandparents away from her monstrous husband, which leads to Charlie taking his frustrations out on the Japanese. That’s in-character too. Remember how it took him half a season to admit he didn’t put Helen in G Group out of pettiness? Charlie has always been a little twerp, and now he’s a little twerp at the levers of a violent bureaucracy. So while Frank successfully secures a seat for Charlie on the target committee, Charlie uses it to his own ends. Frank’s second weapon is out of his control too. As for the question of Jean Tatlock, I suppose Oppenheimer’s right in that intensely creepy moment that we’ll never know what happened in that apartment bathroom. “Bucher” tells Paul a bathroom is the best place to stage a suicide, after all. But if the culprits come down to Darrow and Charlie—nether as the direct killer but rather as the man who, let’s say, made the decision on where to target the weapon of choice, if you follow—look how each reacts. Charlie laughs it off. He has a perfectly reasonable explanation. Darrow points fingers at Charlie and threatens Abby. He doesn’t deny anything. He also reacts with Charlie-like condescension—“You’re confused, Abby”—which, notably, Charlie lacks when it’s his turn. Abby points out that Darrow is keeping her there on the base, and she notes with surprisingly little suspicion that he also records every conversation (at least) in his office. With some time and distance, Abby could come to a reasonable conclusion that Darrow had Jean killed. We don’t even need time and distance. After spending hours in the interrogation room with Victor, Darrow rushes out—shirt partly unbuttoned, sleeves rolled up, sweaty as hell—and tells “Bucher” and Paul, “Clean it up,” referring to the room he’s just left with the newly dead man inside. Darrow’s the killer here, not Charlie. Except. Well. Charlie pours his heart out to the targeting committee, a standout scene among many for Ashley Zukerman, to get them to drop the bomb on Japan. They’re hot to drop the bomb on a military target as it is. Charlie does them one better: “No, a city. Full of civilians. And detonate at the altitude that will give us the widest blast radius…It has to be catastrophic on a scale no one has ever imagined.” “Brooklyn” is so well-braided that Charlie’s speech echoes Liza’s dramatic lecture about fallout and Nora’s changed plan. That is, Nora wants Jim to reprogram the circuitry so that the bomb explodes here in New Mexico, wiping out all the brains who know how to make it. “We do one terrible thing tomorrow, but then no one ever has to again,” she says. They’re writing a history of peace, or something. Charlie says the same thing about using the bomb on civilians. Face up to man’s greatest evils once so that nobody will have to in the future. And Charlie doubles down on the irony of Frank’s history of peace speech. We have to kill children in order to protect children, using a memento from his own child who has been ferried away from him for safety. The future—I’m glad he brought that up, and not just because Manhattan only has one episode left this season and isn’t yet renewed. 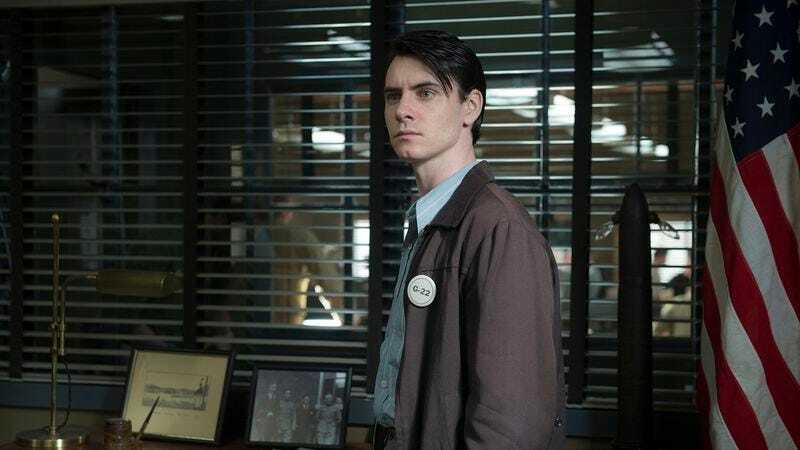 Ever since Los Alamos heard what happened to Hitler and especially throughout “Brooklyn,” there’s a strong sense of a new world. “Brooklyn” being first and foremost a cautionary tale about inventors losing control of their babies (Frank and the bomb, Frank and the seat the table, Charlie and his son), innovation is consistently used for oppression. “Bucher” tells Victor that Hoover has all kinds of new ways to track people down, a threat pointed right at Victor’s daughter, wherever she is, not that it matters. “Bucher” also introduces Paul to the future of espionage. “We’re forming a new breed of intelligence organization. One with a more…centralized approach,” he says before winking at the camera. And these intelligence officers will be the ones waging the new war, a…cold war, you might say. “Bucher” is dazzled by all this, but we see it through Paul’s eyes. The future of war is going to be ex-doctors and -physicists staging suicides for the military? Zero transparency has been a nightmare on the hill. How excited is Paul going to be about that? He’s a tough sell, but suddenly I see not just light but more road at the end of this tunnel. Jim working with the Soviets and Paul with the CIA is too neat not to want to explore. Time to rally the fans. The ending of “Brooklyn” is a four-car pile-up of darkness, theoretical violence punctuated by physical violence, the fearsome implosion team finally fractured not from army compartmentalization but their own personalities, and worst of all poor naked (mustacheless) Fritz. He’s still mourning Jeannie, opting to review his wedding video instead of attending the test. Michael Chernus has been heart-breaking enough as it is already, and then from beyond the grave we find out exactly how much Jeannie believed in her husband. She told Paul she knew the scientists were going to change the world, and she knew Fritz would keep them honest. No doubt that’s true. Unfortunately her death has kept Fritz out of the fray, and without him there—probably more correlation than causality, but it bears thematic weight nonetheless—Charlie and Jim are both contemplating serious destruction. Lucky for Paul the camera lingered on Jim and his curious cap emblazoned with the Brooklyn Dodgers B. The ending is a great segue into spy thriller territory, all timing and coincidence and skill. Helen’s new squeeze Stan turns out to be Perseus the Soviet spy. Paul cottons onto Jim’s possible double agency. And Helen confronts Frank about dragging his feet. Apparently he’s been diverting bomb money to his wife’s project, a sweet way to say sorry, but unfortunately for him his work wasn’t done when he got Charlie on the committee. And why is he so brusque with Helen? Just because he’s Frank Winter, or is there something I’m missing? In any event, as we catch up to where the season began, Helen reports Frank to Darrow and Paul reports Jim to Frank. Jim and Charlie are on their way to play with their toy, and Fritz is getting drunk. That old season-one tension is back with a vengeance. We’ve known all along this was headed to Jim getting alone time with the bomb and Frank as persona non grata, but “Brooklyn” pulls every string as tight as it can and plays them all at once. That’s how you make the inevitable exciting. “Brooklyn” is written by Dustin Thomason and directed by Michael Uppendahl. Frank tries to prep Charlie on how to sway the committee, but Charlie isn’t convinced a demonstration will be convincing enough. Charlie says, “Hirohito isn’t Harry Truman. His people think he’s a god. Gods don’t bow to armies.” Frank responds, “It’s a second sun. The emperor’s not surrendering to another army. He’s surrendering to the power of the universe.” How different would things have been if Frank had been on that committee? Talk about sacrificing a few to save the many. If Frank had just sacrificed Charlie, the war would have been won sooner and Hiroshima and Nagasaki might have been spared. Lord knows Abby might have preferred to lose her husband that way. “Bucher” begins his little chat with Victor: “‘Let one hundred mothers cry, but not my mother, but better my mother than me.’ You know who said that? George Washington. Kidding, it was an Arab.” Justin Kirk has only been in two episodes and “Bucher” is maybe the best new character of the season. I can’t help but wonder if a little more space could have made Kitty Oppenheimer or at least third-leg Lorentzen stronger rivals to that claim, but Darrow and Nora hold their own, too. Abby confronts Darrow: “I’ll tell Charlie. I’ll just tell the police.” Darrow: “Come with me.” And she does. Like a chump. Take a lesson from Don Draper. If whatever information she thinks she has on Darrow is supposed to frighten him, what else might it make him do? 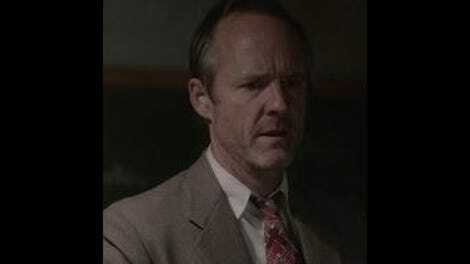 Darrow: “You should be careful whom you accuse, Mrs. Isaacs. And may the Lord forgive us all.” Yeah, there’s the hypocrisy angle, too. Or maybe confession and atonement wipes his slate clean. In any event, Darrow’s a little dictator. He’ll make a great Senator. Daniel London is another secret weapon on this show. Oppenheimer’s grand melancholy is only going to increase, right? As of “Brooklyn” he terrifies Abby with a conjecture, fires her on his way out the door, and punches Charlie out of the blue. Team Oppenheimer!